Members will vote on the next book after, The Charisma Myth, How Anyone Can Master the Art and Science of Personal Magnetism is completed. Join Today! 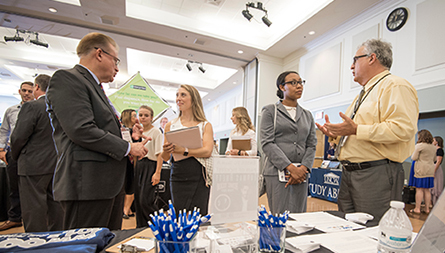 Using Handshake, alumni can search jobs, post resumes, sign up for interviews and explore employers registered for UNCW job fairs. Job opportunities are also shared on the UNCW Alumni LinkedIn group. Connect with UNCW's Career Center for career counseling and assessments, or join the alumni online book club to discuss books on business, communications, leadership, productivity and more. Make connections with alumni in your industry or area during alumni events and events hosted by the Career Center such as Internship and Job Fairs, Graduate & Law School Day, Nursing Career Day, Resume Doctor Clinics and more. The alumni office partners with the Career Center to provide virtual career coaching, networking and industry-specific student mentoring. Events are listed on the calendar, and invitations to participate are sent by email. Other ways to connect include the alumni online directory, an exclusive benefit for Seahawks, or the "find alumni" feature on LinkedIn which searches more than 55,000 alumni with profiles or the 8,000 members of the UNCW Alumni Association group. Consult with fellow alumni in a hiring capacity or get involved with the Career Center's Employer Advisory Board to interact with other employers in the region and access key talent for employment opportunities. Job opportunities can be shared on Handshake and LinkedIn, and rooms can be reserved through the Career Center for on-campus recruiting. 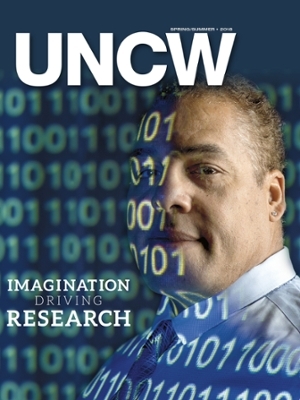 Explore UNCW news, alumni stories, class notes and more with the UNCW Magazine. Not receiving the magazine? Update your information! This bi-monthly e-newsletter shares exciting updates, upcoming events, opportunities to get involved and more. 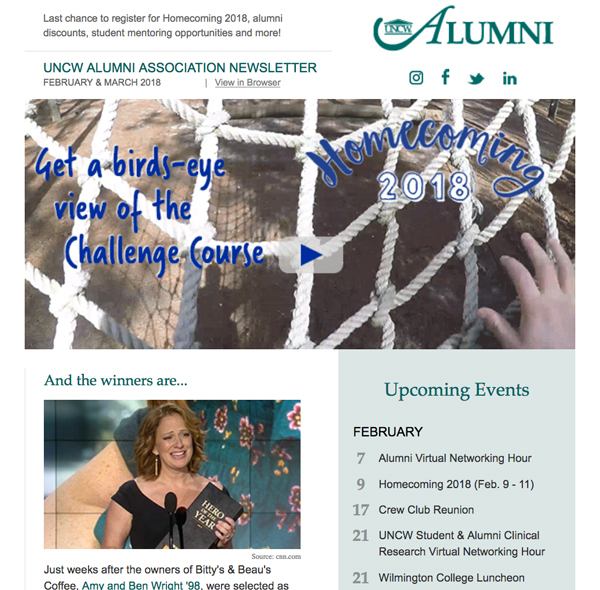 Not receiving the UNCW Alumni E-Newsletter? Update your information and add alumni@uncw.edu to your email contacts. Show off your Seahawk spirt and support current students with a UNCW License Plate. $15 of the annual custom license plate fee supports UNCW Alumni Association scholarships. From career services to discount opportunities to access to Randall Library and the Student Rec Center, there's something for everyone. If you have ever attended UNCW, you do not need to request a UNCW transcript. The Graduate School will be responsible for obtaining that academic record (at no cost to you), including any transfer work reflected on your UNCW transcript. However, you are required to submit official transcripts from any institution not reflected on your UNCW transcript or any institution attended after UNCW. View your UNCW transcript in SeaNet. Alumni, friends and family can apply for their passport for the first time by visiting UNCW Passport Services on campus. Learn more online or by calling (910) 962.2432. UNCW alumni qualify for a 10% discount on professional development courses. Provide your graduation year upon registering to obtain the discount. Learn more. For borrowing privileges, there is a $25 annual fee, which is waived for those over the age of 65. A computer use card is free to all North Carolina resident alumni, and just requires a valid driver's license. The Student Recreation Center (SRC) offers admission to UNCW alumni in one of two ways. Alumni who have a UNCW One Card (see below) can access the gym during it's normal operating hours by paying a $5 daily fee. Alumni who do not have a UNCW One Card must have a student, faculty or staff member sponsor and must pay the $5 daily fee. Find out more. Alumni can obtain their UNCW One Card by visiting Auxiliary Services located in the back of the Warwick Center. Using the card, alumni have access to the Rec Center and can upload Seahawk Buck$ to use at any point-of-sale location on campus such as the Campus dining locations, UNCW Bookstore, Sharky's Box Office, Seahawk Mail, Dittos, vending machines and more. The cards cost $20 and does not expire. Please call (910) 962.3560 for more information. Alumni receive a 10% discount on tickets to all performances by UNCW Presents. Schedule can be found online or by calling 910.962.3500. Alumni are able to reserve the Wise Alumni House for events for themselves and their children. For details, please contact Conference Services at clconferences@uncw.edu or (910) 962.7119. Directions to the Wise Alumni House. For reservations, call the hotel and request the UNCW rate. Please note: rates are subject to change at the discretion of the hotel. The association has partnered with GEICO to provide alumni with discounted rates on their car insurance, and home or rental insurance. Get a rate quote even if you have Geico insurance already, it could result in big savings! Enjoy group rates for health, dental and life insurance with Collegiate Insurance Resources, the nation's premier provider of insurance programs for alumni. Call (800) 922.1245 or visit them online for health or dental information.